In November last year, the Guardian reported that it had more than 800,000 contributing readers, four times the number it had just six months earlier. Getting to this point took a great deal of experimentation and belief in what The Guardian stood for, according to Anna Bateson, the first chief customer officer at Guardian News and Media (GNM), speaking at Campaign's Digital Media Strategies conference yesterday. "From the beginning, philosophically, Guardian wanted to avoid gating its content. Our purpose is to allow as many people as possible to have access to our journalism. This was inconsistent with the idea of a paywall – we didn't want to create a situation where only the rich could read us," Bateson said in an on-stage interview with Campaign's head of features, Nicola Kemp. So the publication started to experiment with the idea of membership. "The original thinking was that we'd build it around events, we were even going to buy a building... until someone did the math and realised there is no way we would have enough members to pay for it," Bateson said. An events offering was just too hard to scale on that level, and with two-thirds of its readers overseas, UK-based events would exclude dedicated readers. "So we started asking, if we were to try asking people to contribute, how and where would we ask them? What if you embedded the request in the heart of journalism, how would that work?" Bateson said. "There were snooty articles and cartoons mocking us at first. And, internally, people were uncomfortable because it sounded like we were begging. But through lots of experimentation, it began to work," Bateson said. While GNM's success was partly spurred by external events that inspired readers to care more about good journalism, people are truly willing to pay for something they value, she continued. "If you can communicate where their funding is going, they’re willing to give. And they are willing to give all around the world," Bateson said. The articles which convert people to donating money for journalism tends to be around content that is exclusive, rich and is clearly resource intensive. But, more than anything, readers were contributing for articles about causes they cared passionately about. "These ranged from environmental causes to quite visceral reporting," Bateson said. "If you pitch the ask in the right way." 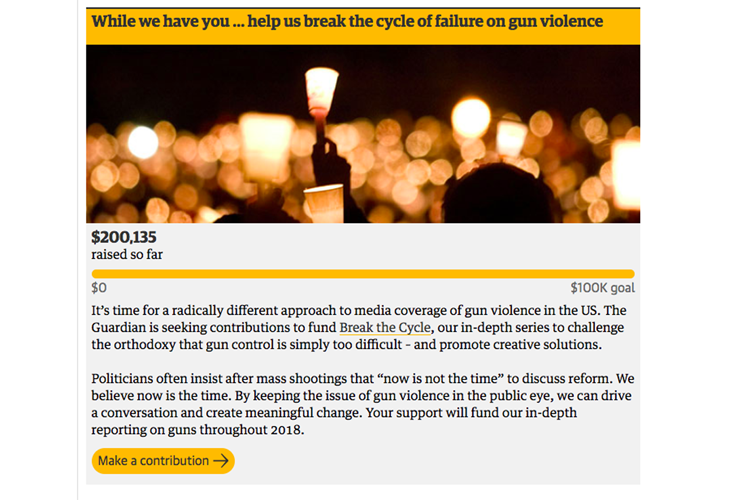 Guardian is currently running a campaign in the US to raise money to fund a permanent reporter to cover the subject of guns. "The pitch was to keep these stories front-of-mind to inspire change. We positioned this campaign around the Florida shootings and it has raised a large amount of money from people who want to do something. In this case, make a donation," Bateson said. The key, Bateson said, is transparency and trust. "We could not ask our readers for money if they did not trust our brand and we have to be transparent about where the money is going and how we do what we do. Commercial avenues, she continued, have to work with the brand's value and purpose so as not to compromise editorial integrity and thus, the reader's trust. "If your revenue streams are true to your purpose, you should be fine." HuffPost EIC: Women and media - are we listening to our audience?